Today: Lara Ferroni makes a smoky, spicy condiment that will bring life to every dinner this week. I love chipotle peppers, but since a single pepper is usually plenty to spice up most dishes, I always end up with the remains of almost-full, opened cans sitting in my refrigerator. Instead of letting all the heavenly adobo and chiles go to waste, why not craft a whole week's worth of meals around them? Start by blending the entire can of chipotles and adobo with two cups of plain greek yogurt or sour cream and a touch of water to thin if needed. You’ll have a chipotle cream that is hard to resist slathering on everything. More: Another condiment you'll want to put on everything, all week long? Gremolata. I have a bit of a bias toward flat enchiladas rather than the rolled kind. (I think it’s my New Mexico heritage showing through.) Fry tortillas in just a little oil until they are crisp around the edges, and then layer with warmed chipotle cream, chopped onion, and monterey jack cheese -- I usually use 3 tortillas per stack. (Add a layer of shredded, cooked chicken for a heartier meal.) 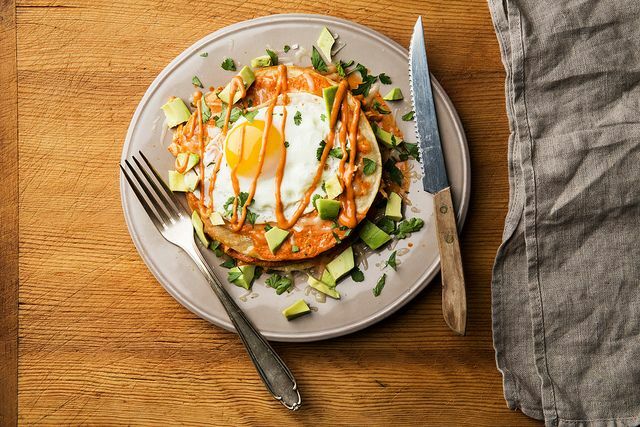 Pop the stack in a warm oven for about 5 minutes to melt the cheese, and the top with a sunny side up egg, a bit more chipotle cream, fresh cilantro, and some diced avocado. 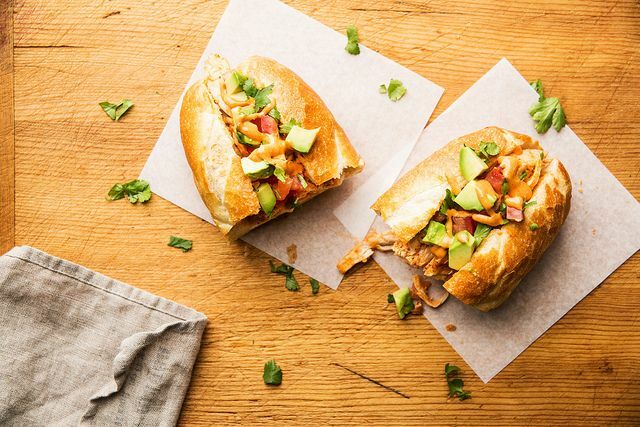 Roasting a chicken at home is great on its own, but to spice it up, I toss leftover meat with chipotle cream, then I pile it high on a crusty baguette with a bit of cilantro, chopped avocado, and tomatoes (but only if they're in season!). A dinner you’ll be happy to eat. 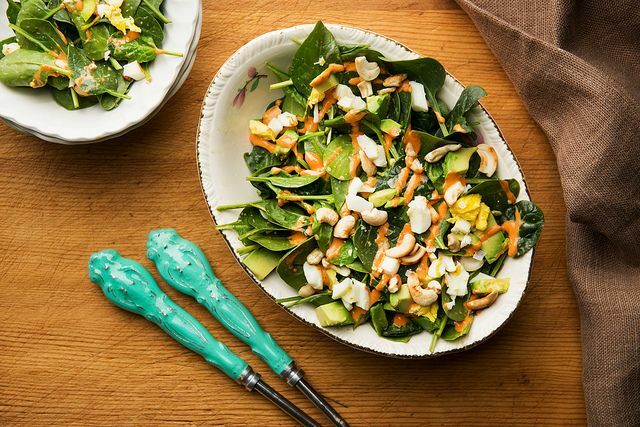 It doesn’t get much simpler -- or delicious -- than this: a bunch of baby spinach leaves, diced avocado, a chopped hard-boiled egg, some toasted cashews, all cloaked in a smoky chipotle dressing. 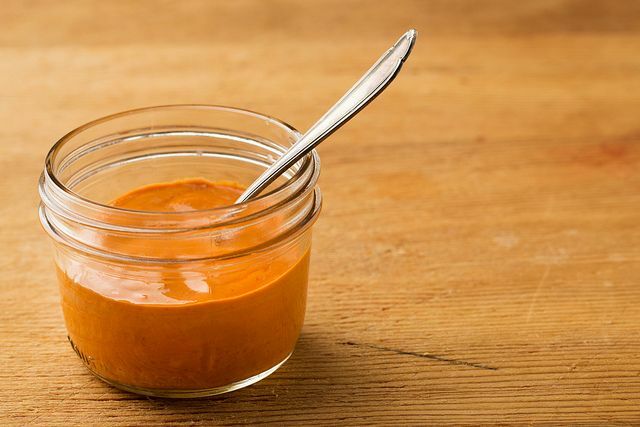 To make the dressing, just mix the chipotle cream with a bit of olive oil to get a creamy but pourable consistency. Season with salt and pepper to taste. Soften a chopped onion and a clove or two of chopped garlic to a large saucepan over medium heat, then add about a pound of chopped, uncooked chicken breasts, a tablespoon of dried oregano, a teaspoon of ground cumin, and a couple cans of white beans, such as cannellini. Toss in a chopped jalapeño if you’d like. Pour a quart of stock over the top and bring to a boil. Reduce to a simmer, and cook for about 30 minutes, or until the chicken is cooked through. Stir in a few tablespoons of the chipotle cream just before you eat, and serve with tortillas on the side. This chili keeps really well, and will be even better the second night. It’s also a great soup for the slow-cooker: just throw all your ingredients (except the chipotle cream) in the pot in the morning and have an amazing bowl of chili ready when you get home from work. This is comfort food at its finest, and it's lightning-fast. Ready? Cook up a big pot of pasta, stir-fry some kale in olive oil, throw in a few sliced almonds, the pasta plus a bit of the cooking water if necessary, and a healthy dollop of chipotle cream. For dessert (or dinner, if it's that kind of day), spice up your ice cream. Chipotle may sound like a crazy addition here, but the subtle smoke it adds makes for a real winner of a dessert. 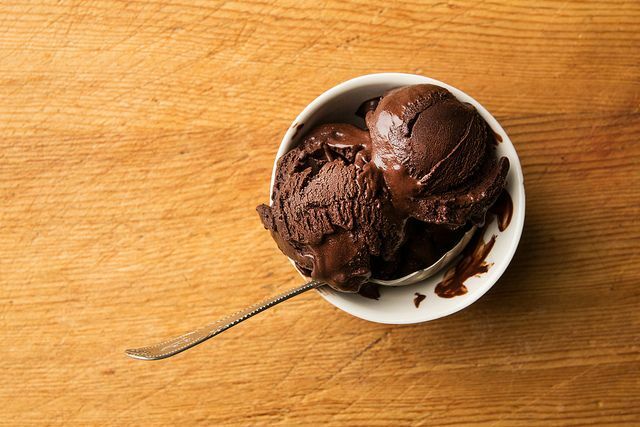 Just blend about 2 tablespoons of the chipotle sauce into your favorite chocolate ice cream or sorbet recipe (try this amazing one from David Lebovitz!). 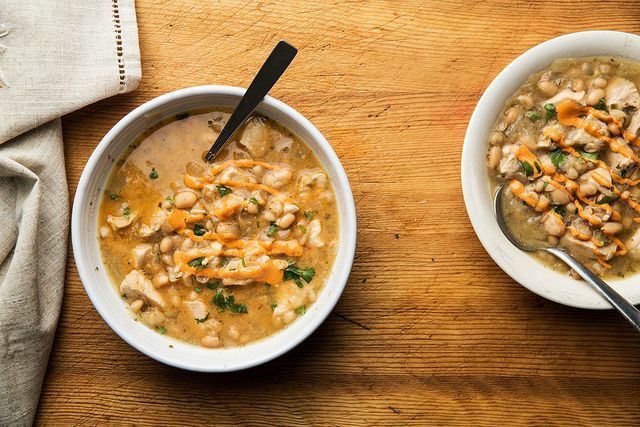 How many does that white bean chili serve? Also - used the extra crema for some awesomely fast and tasty saucy chicken tacos. Saute some onions and garlic, toss in a can of diced tomatoes and cook it down a bit. Remove from heat and stir in a bunch of the chipotle crema (a cup or two to taste), then stir in shredded rotisserie chicken. Stuff into tortillas, top with shredded cabbage if desired. DONE. Loved it! Yum! I made the pasta w/ kale recipe noted here - added a can of chickpeas and some garlic to round it out. Loved it! Nice change of pace for pasta. I will say - the chipotle crema was way too hot for us when prepared as written (one can of chipotles to two cups yogurt). I'm not usually overly sensitive to heat, but this just about burned the back of my throat on first taste. I recommend adjusting the ratio to go a bit heavier on the yogurt and lighter on the chipotle peppers, especially for the pasta dish where you want to use a decent amount of the crema to get the flavor. But still - a keeper! This is great! We have thrown out so many cans of chipotles in adobo (minus one). 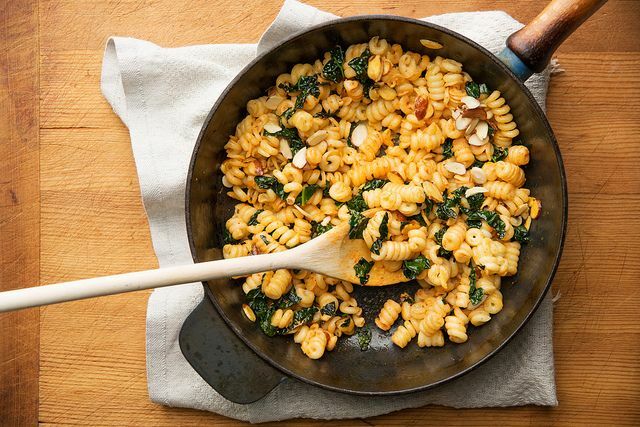 We tried the kale and chipotle pasta and loved it. And the leftover chipotle cream, well I think that will go on sandwiches and eggs thus weekend! but elle. no need to go to all that trouble. freeze all in a little container; use a fork to scrape out, frozen, what you need. Also, on Chowhound discussions, some keep their puree in the frig and claim ir never goes bad. And of course, you can always puree the chipotles, put Tablespoon sized blobs on a piece of waxed paper and freeze them. Once frozen, they plop into a freezer bag for the next time you need a little something, something! Genius. Completely genius. I want to eat all of this immediately! thank you le bec fin for that advice on the differences between brands! I have only ever been able to find the La Molina and found it so strong. I will definitely keep my eye open for the San Marcos. I love it in black beans with sauteed onion, garlic, crushed fennel and coriander, a few (seeded) sauteed cherry tomatoes and a bit of butter and fresh lime added at the end. faye, it never occurred to me to put fennel and coriander in black beans; i wish you lived next door so i could taste that. Brilliant piece; thk you!love your recipes as well. I use the San Marcos brand in a red white and blue can, as they have had their seeds removed and their thick adobo sauce is an excellent one. The La Molina brand, in an orange can, is awful because it has seeds, and the sauce is not complex. Also, I find that for my taste, just mixing chipotles with crema is rather one dimensional. My recipe includes sour cream and/or mayo, minced garlic, OJ concentrate, pureed chipotles, Salt and a touch of lemon juice. It is a go-to condiment for us;My Love puts it on all kinds of sandwiches! amounts of chipotle and O.J. ** frozen pureed chipotles keep well. Scrape out amount w/ fork tines as needed. I puree the whole can of chipotles en adobo and keep it frozen in a little plastic tub w/ a tight lid. Very easy to scrape out what you need later. I also use this chipotle cream on my Cubano, with roast pork, ham, gruyere and pickles! Sounds like a delicious sauce! I'm not into heat and thus usually ignore chills, but this post re-peaked my curiosity. Just how hot would you say the ones inn adobo are? It will vary a little by brand... and the chiles straight from the can can be quite spicy... but they are definitely easy to temper with the yogurt... it is definitely easy and still delicious to add more yogurt if the spice is too much for you. What a perfect solution to the left over chipotle in adobo dilemma. Fantastic collection of ideas for an ingredient I often have knocking around the fridge. Thanks Lara! This looks great! I'm forever freezing the remains of a can of chiles in adobo, and I love the idea of making a sauce of them. I can't wait to use this sauce on all kinds of things. Hi Antonia - yes, I actually used an immersion blender for mine... it's one of my favorite kitchen tools! Hope your son enjoys the recipes! Lara -- I LOVE this idea. I have a similar penchant for chipotles but also end up with much of the can wasted, even though any sauce I make with them always ends up eaten. This is such a great solution. This is wonderful Lara! I love all of these ideas.